As I looked at the enamel cup bought for measuring out the bird food, I reflected on the previous most common use for enamel coated tin mugs. They were for the use of domestic servants, who generally did not share the family crockery although they very often lived in an out-building on the property. The simple mug suddenly encapsulated the mindset of otherness. The road from when Mandela became president to now has been a long road for whites in South Africa to slowly shift generations of perception toward black South Africans. Most whites welcomed the end of apartheid, we embraced the new ideology of our rainbow nation. We want to play a part in the multi cultural arena which has formed during our lifetimes. Despite all the good will, we have failed to recognise that this is not a quick fix, change takes time. For our children who have black classmates, black friends and black neighbours there should be almost no effort not to be racist. 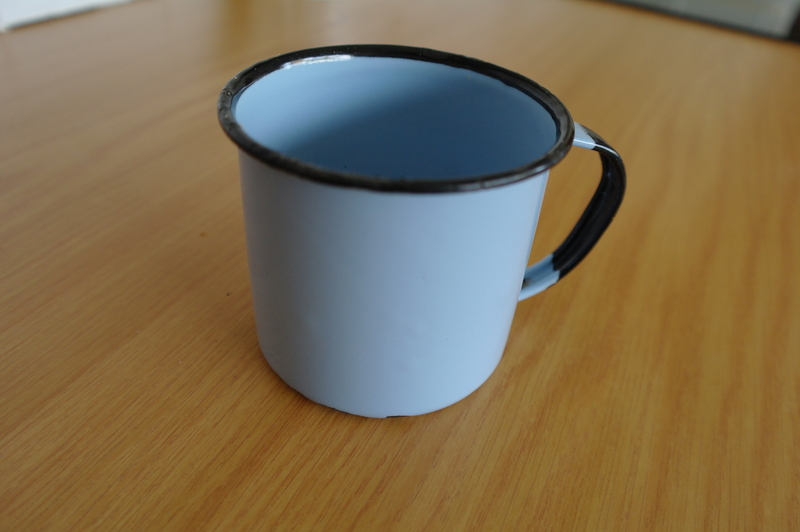 For those of us who grew up under apartheid, we will do best not to forget the enamel mug mentality which we come from. We cannot pretend that after 1994 we suddenly shook off generations of wordless lessons which told us that blacks were inferior, that we could not drink from the same cup. When I was little I loved to sit in our ‘maid’s’ quarters on the property, I loved to watch her crocheting and absorb the warm unique smell of her presence. A blend of Zambuk, candle wax and mysterious scents which wrapped around me like a blanket. I may have loved her but I never really knew her, knew nothing of her family or children, she belonged to us. Our family treated domestic workers well but still as ‘others’ as ‘aliens’. My parents had simply continued the mindset ingrained by their parents and grandparents. My paternal grandmother never cooked a meal, she trained her ‘house boy’ and he ran the house. She had a little silver bell which was always at her side, it was used to summon her ‘house boy’ for any and every task. At some point Gran’s ‘house boy’s’ daughter moved into the main house and was later adopted by my aunt. It struck me as very unbalanced that her father would then make her bed and serve her while he still lived in the outside room. It must have been very hard for him to then command the respect which was due to him. The situation created an imbalance in father daughter relations with her being elevated above him. During my entire childhood I never interacted with a black person of my age on any level at all. Blacks lived in different areas and went to different schools. In high school I once went to an English course covering poetry and plays during the school holidays, it was attended by pupils from many schools. That was my first and only interaction with black teenage girls. It was an absolute eye opener, there I encountered peers who were no different to me, the impact was enormous. I have to be honest here, I do sometimes think racist thoughts. I am ashamed to admit it. I would love to think of myself as not seeing colour but there are times when I do. What I must do is acknowledge that I still have traces of racism in the fabric of me, if I do not acknowledge it, I will not be able to tackle the root of those thoughts. To justify racism is to fail myself, my fellow-man and my country. I envy the children of today in that they have a clean slate. As a parent I have the enormous responsibility not to perpetuate the errors of previous generations. It is not enough that my children can now integrate with peers of all races, they learn most at home. Of course no enamel mug is given to an employee to drink from but my children must see their parents treat all races equally at all times, if they don’t we will have failed them. A thoughtful and incredibly honest post. Thank-you for sharing this. You are right in that we need to make a conscious effort to be aware of this ‘ingrained mind set’ that can so easily be passed on from generation to generation. Children, especially, absorb everything. We should regularly check our behaviour – what message are we giving the next generation?